A shark stolen from the San Antonio Aquarium over the weekend has been returned and the suspects are in custody. On Saturday, a 16-inch female horn shark named Miss Helen was taken from the aquarium and carted out in a baby stroller. According to a post on the aquarium's Facebook, three suspects staked out the interactive shark touch pool where the shark was contained for more than an hour "to wait for this opportunity." The suspects grabbed the shark when an employee staffing the tide pool exhibit stepped away momentarily, according to the post. They then entered one of the aquarium's filtration rooms where they poured a bucket of bleach used for disinfection in the facility into the filtration system, "causing harm to other wildlife." They then used the bucket to help them bring Miss Helen to the stroller, up the stairs and out to the parking lot. An employee alerted management and the suspects, two men and a woman who carried the baby while the shark was in the stroller, were confronted in the parking lot, but denied the staff from searching their carriage or car and they could not be detained. 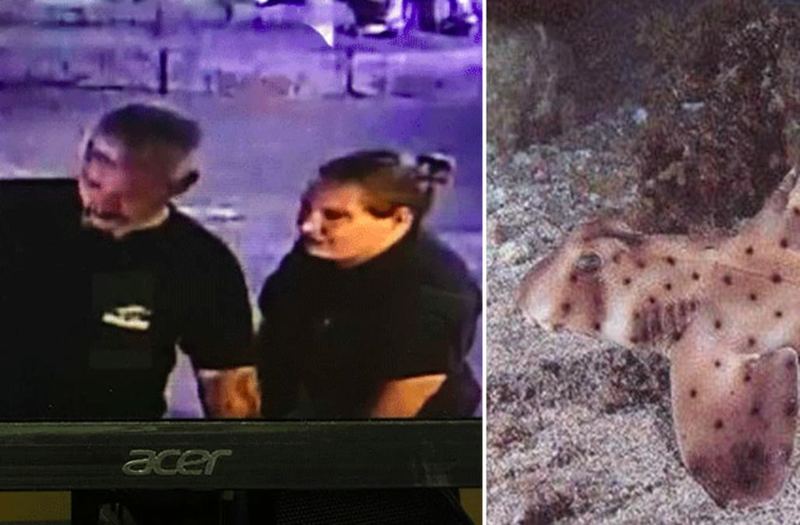 The aquarium released surveillance video of the incident and said it was working closely with the Leon Valley and San Antonio police departments. "We value the lives of all of our animals and take pride in the care that we are able to give them as well as the education that we are able to give to the general public about these treasured species," the Facebook post said. Additionally, "the fast acting experienced staff" prevented the bleach from doing real damage. According to CNN, the police's search led them to the home of a man on Monday who has an expansive collection of marine life. "When we got into the garage and into the house it looked like almost a mock up of [the San Antonio Aquarium]," said Leon Valley Police Chief Joseph Salvaggio. "He knew very much what he was doing and kept that animal alive." One man has been charged with theft and charges for the two other suspects are pending, CNN reported. By Monday night Miss Helen was back in the aquarium, welcomed home with cheers and applause. In a video on the aquarium's Facebook page, an employee said the shark, which is less than a year old, appeared healthy. "It's phenomenal. I cannot believe what she's been through," said Jamie Shank, assistant husbandry director at the aquarium, "She's a little fighter. She's a survivor. I'm very proud of her." Miss Helen will be held in quarantine as staff test the water she was held in, which was colder than her usual environment, and slowly acclimate her back into the aquarium.